Stokvis Energy Systems is a leading supplier of Commercial Boilers, Packaged Plate Heat Exchangers, Pressure and Booster sets, Water Heaters, Solar Panel Systems and Gas Fired Heating, Ventilating Systems and Heat Interface Units. Based in East Molesey, Surrey, Stokvis manufacture a broad selection of high performance products and systems including their new Econoplate “H” Series interface unit to provide the interface between a district heating scheme and individual properties requiring heating and hot water. 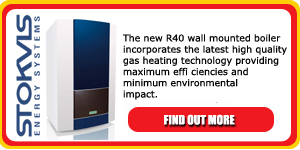 For the transfer of heat or cooling from one system to another, both as a pressure break or system separation. Stokvis have an extensive range of both Bare Plate and Frame gasket heat exchangers (BPHE) and Compact Brazed heat exchangers (CBE) as well as a full range of fully packaged units for installation in a wide range of applications. 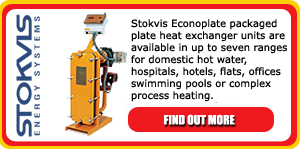 Stokvis Econoplate units are constructed around an epoxy coated chassis containing the heat exchanger incorporating a number of gasketed stainless steel heat transfer plates which create the channels for both primary and secondary media to flow through, making a single pass in opposing directions, enabling the heat exchange to take place. Plate numbers can be increased as required, up to the chassis limit, enabling the output capacity to be increased as required. Plate heat exchangers have low water content and low thermal inertia, which makes them ideal for use in systems with varying heat loads. Econoplate units are supplied packaged with, if required, a primary pump (single or twin-head) and/or a 2,3 or 4 port motorised control valve, fitted to the primary circuit.